The next generation of the successful E430 is here, now equipped with a replaceable battery pack. Most workers or users of industrial grade devices will never open the unit, this is left to IT and service departments. Companies usually would like access to the SIM card and SD card slots to swap out cards and change the devices storage amount at any time. Having access to a device's storage cards and information in an era where millions of smart phones can be opened or serviced at any time has become an increasing debate. The new Winmate E430RM2 will not have that problem and offers the user full access. To replace the battery, the two latches need to be slid upwards and the battery to be pulled up from the top of the pack. Under neither the Battery the user will find access to the micro-SD card and SIM card slots.The E430RM2 received an upgrade in the battery capacity department as well, jumping from the standard 2600mAh to a new 3900mAh pack; this will provide the new E430RM2 with longer operation time for extended time on the job. As in previous versions, the E430RM2 provides a modern look and feel with state-of-the-art handheld technology in a tough and rugged device. 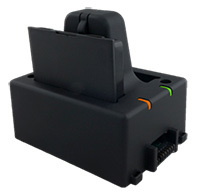 Building on the overall design of the E430 series, this new model remains completely compatible with all prior peripherals, including a 1D/2D barcode scanner or HF RFID reader. The device also includes a 2-megapixel front camera and a 5-megapixel rear camera with an illumination LED for documentation and data capture. 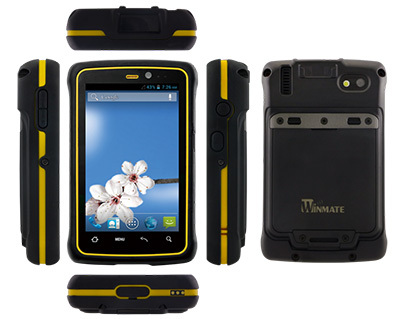 The E430 series is just as tough as the rest of the family; all Winmate handheld devices are designed to be used in unforgiving environments and are built to take a beating. The E430RM2 offers IP65 sealing (standard model, w/o sensors), a 4-foot drop specification, and a -30℃ to 60℃ operating temperature range, this ensures the user peace of mind when those accidental drops and spills happen. 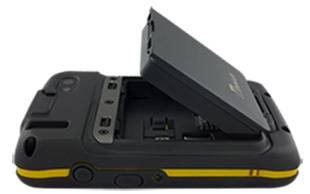 The battery charger is designed to support up to two packs, this ensures you will never bestuck in-between charges. 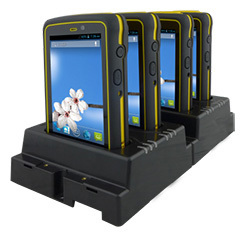 This charging dock is ideal for quick charging multiple devices at once. The design allows you to daisy chain multiple chargers together for ease of use and less power cables.